Children everywhere love to climb and move around in trees. 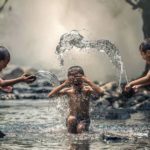 You can read ethnographic accounts from around the world and find this mentioned as an aspect of play in children. Why is this phenomenon so widespread, though? Well, you are a primate (presuming it is a human reading this anyways); you have grasping hands and binocular vision because your ancestors spent millions of years adapting to life in the trees, the mobile shoulder joint which allows you to throw, to press overhead, to bridge and to turn handsprings, was first developed by our common ancestor with apes for suspensory climbing, which allowed larger-bodied animals to move through trees while distributing their weight over more branches. Evolution most often works by modifiying structures evolved for one purpose and repurposing them when a new capacity is needed. The grasping hand that allowed us to climb trees has been remodeled to allow us to be more nimble tool users; the shoulder joint has adjusted to allow fast and accurate throwing, something that is nearly unique to human beings; but these are just tweaks to the original design, they are not new parts or complete redesigns, and we have retained the capacity to move arboreally. Moving through trees is in fact a major skill for human beings; it has continued to be a strategy used to hide from predators, hunt game, and harvest fruits, nuts and honey. As humans our primary locomotive capacity is bipedal, running and jumping primarily over relatively simple terrain, but climbing, swinging and that general arboreal movement, has remained a very important secondary capacity and one with an incredible deep heritage in our ancestry. It has remained something that children are innately driven towards because it was such a big part of our past; we have been bipedal primarily terrestrial creatures for at most 6 million years and it is likely that the full transition to our modern bipedal dominant lifestyle wasn’t complete until 2 million years ago. Compare that to the 60 million years our ancestors were primates, and while it’s primacy as mode of locomotion has receded, terrestrial movement has remained part of the human movement adaption until quite recently. You should move through trees because your body evolved to do so, and it develops best when exposed to the stressors which are primal part of its movement inheritance. So what are the current benefits we get from playing in tree? I have mentioned before that I have seen via informal observation that pulling strength in children is strongly correlated with their access to trees to climb (rock climbing, bars and rings can play similar roles of course). Few environments require and develop gripping strength and pulling strength through a huge variety of motor patterns like moving in trees. IF you want a strong foundation for the upper body, move in trees, as it’s the stimulus our bodies evolved to develop strength for and through. But it’s more than that. Training for movement complexity has become very popular recently, and it’s a good concept, since our nervous system has the inherent capacity to solve new movement challenges that capacity is developed through regular exposure to complex movement patterns, novel patterns and diverse patterns. Many approaches to movement complexity, however, primarily use environments that are themselves poor in complexity. There is a tremendous amount of interesting movement you can find just on flat ground of course, but the environment itself carries a huge potential to provide complexity and generate creativity. Trees provide more complexity then any other environment to move through; this is why arboreal creatures are the most agile of all. Trees have curvilinear unpredictable shapes, they are rounded and highly textured, their branches break up the visual field and interfere with depth perception for those not used to that environment. Ever tree limb in a sense requires a slightly different grip position and pulling strategy to climb, every precision landing involves solving not just depth and width of on object but the slope and features and possibly the sway and drop as the limb moves underneath you. Trees provide the most proprioceptively enriched movement environment with the greatest number of variables to solve. 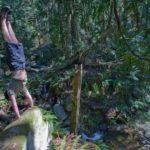 Depending on the type of tree, movement through trees can involve running, jumping, balancing, climbing and swinging, virtually every type of movement in parkour, and they often have to be combined seamlessly. 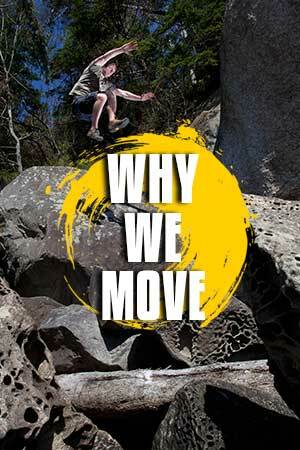 Movement in trees also forces us to use all three planes of movement in a way that more flat surfaces like boulders and walls don’t, and it forces you to use relatively wide ranges of motion developing mobility as well. If you want to be a mover who is adaptive to a broad range of variables, who is strong and mobile and able to solves complex motor problems easily, and who can find fun places to play all over the place, making training in trees a big part of what you practice is a great place to start.